CMV is a major clinical problem in transplant recipients. Thus, it is important to use sensitive and specific diagnostic techniques to rapidly and accurately detect CMV infection and identify patients at risk of developing CMV disease. In the present study, CMV infection after liver transplantation was monitored retrospectively by two molecular biology assays - a quantitative PCR assay and a qualitative NASBA assay. The results were compared with those obtained by prospective pp65 antigenemia determinations. 87 consecutive samples from 10 liver transplanted patients were tested for CMV by pp65 antigenemia, and CMV monitor and NASBA pp67 mRNA assay. CMV infection was detected in all patients by antigenemia and CMV monitor, whereas NASBA assay identified only 8/10 patients with viremia. Furthermore, CMV infection was never detected earlier by molecular biology assays than by antigenemia. Only 5/10 patients with CMV infection developed CMV disease. Using a cut off value of 8 cells/50,000, antigenemia was found to be the assay that better identified patients at risk of developing CMV disease. However, the kinetics of the onset of infection detected by NASBA and CMV monitor seemed to have better identified patients at risk of developing CMV disease. Furthermore, before onset of disease, CMV pp67 mRNA was found to have similar or better negative and positive predictive values for the development of CMV disease. The present data, suggests that the concomitant use of antigenemia and pp67 mRNA assay gives the best identification of patients at risk of developing CMV disease. Cytomegalovirus (CMV), a member of the human herpesvirus family, causes a lifelong persistent infection that is usually well controlled by the host immune system. However, in patients with defective immunity, as recipients of allogeneic solid organ (SOT), bone marrow transplants (BMT) and individuals infected with HIV, CMV remains a major clinical problem [1,2]. For this reason, diagnostic methods that rapidly and unequivocally identify emerging CMV biologic activity (i.e. replication, viral gene expression), preferably discriminating between subclinical and symptomatic infection are required for optimal surveillance and management of CMV infections. CMV dissemination in the blood occurs during active infection and viremia has been recognized as the major virological risk factor for the progression to clinical disease . In this respect, there have been numerous studies that investigate the correlation of systemic CMV viral load with symptomatic CMV disease in immunocompromised patients [4,5,6,7,8,9,10,11,12,13,14]. Quantification of the polymorphonuclear leucocytes expressing the CMV tegument pp65 protein by the antigenemia assay, can be used to predict CMV disease and to monitor antiviral treatment [4,5,6,7]. Equally, quantification of CMV DNA load by PCR has been used as a marker for the prediction of CMV disease [8,9,10,11,12,13,14]. The detection of mRNA for the viral matrix tegument pp67 protein in blood leukocytes reflects viral transcriptional activity and has also been showed to be a specific assay for monitoring the onset of symptomatic CMV infection and antiviral therapy [15,16,17]. In the present study we evaluated 3 methods for the diagnosis of CMV infection and the identification of patients at risk of developing CMV disease, before the onset of disease. Quantitative pp65 antigenemia prospective results were compared to the retrospectively obtained data by quantitative PCR (CMV Monitor) and a qualitative pp67 mRNA assay (Nuclisens CMV pp67) in a series of consecutive samples from 10 liver transplant recipients, who had not received prophylactic treatment for CMV infection. Ten patients from the liver transplant program of the Santo António General Hospital were included in the study. These 10 patients were chosen out of a cohort of 34 patients. Selection criteria were that all patients had one positive antigenemia determination and half of them had clinical signs of CMV disease. Seven of the patients were males and 3 were females. Patients' ages ranged from 29 to 58 years, with an average of 38.5 years. One patient was transplanted due to the presence of alcoholic cirrhosis and 9 due to Familial Amiloidotic Polyneuropathy (FAP). Of these 8 had the Met 30 mutation, and 1 the Pro52 mutation. The immunosupression protocol included 500 mg metilprednisolone at the beginning of the surgery and at the anehepathic phase, followed by 4 doses of 50 mg on the first day post-transplant, 4 doses of 40 mg on the second day, 4 doses of 30 mg on the third day, 4 doses of 20 mg on the 4th day, 2 doses of 20 mg on the 5th day, and one dose of 20 mg on the 6th day. Thereafter a dose of 20 mg/day was administered until the end of the 3rd month, 15 mg/day until the end of the first year, 10 mg/day until the end of the 18th month, 5 mg/day until the end of the 2nd year, after which immunosupression was discontinued. The protocol also included the administration of 50 mg azatioprin during the anhepathic phase followed by 50 mg every 12 h during 30 days. Neoral Ciclosporin was also administered, and the drug level monitored by the Tdx method. Drug levels were kept at 350-450 ng/ml during the 1st month post-transplant, 250-350 ng/ml during the second and third months, 150-250 ng/ml until the end of the first year, and 75-150 ng/ml thereafter. 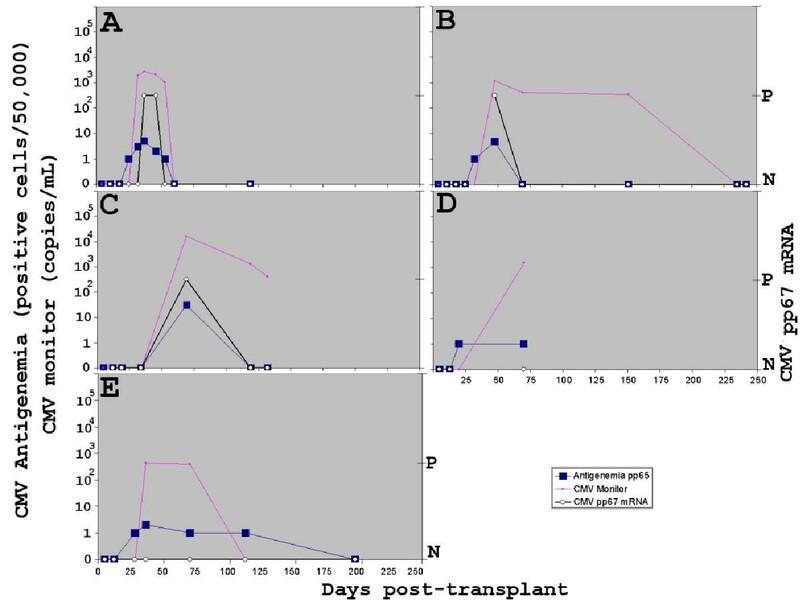 Acute cellular rejection was treated with 1 g metilprednisolone for 3 days and thereafter the reduction scheme followed on the post-transplant was applied. All patients were monitored for the presence of an active infection of CMV, starting between the 1st and 2nd week post-transplant, weekly during the first month and later at each clinical appointment (one and 3 weeks after disclosure and monthly thereafter), or whenever it was clinically relevant. A total of 87 samples were collected from all 10 patients with an average of 8.7 samples per patient (range of 4 to 12 samples). Twin blood samples were collected on sterilized EDTA tubes. One of the samples was prospectively tested by pp65 antigenemia and the result was used for clinical management. The other sample was retrospectively studied by molecular biology methods. Scarcity of the available sample did not allow CMV pp67 determination on 5 specimens. Two of the 10 patients were retransplanted. One of these was retransplanted 24 h after the first transplant due to the presence of a liver arterial thrombosis. The other patient, presented multiple liver abscesses, was retransplanted twice (3 and 7 weeks after the first transplant) and died during the second retransplantation for reasons not related to CMV infection. Nine of the 10 patients were transfused with leucodepleted red blood cells. Nine of the patients were CMV positive before transplant, and the remainder patient was CMV negative. All liver donors were CMV Ig positive. CMV infection is defined as isolation and/or detection of virus from any tissue or body fluid or serological conversion to CMV in a patient who was seronegative before transplantation. In the context of the present work, we used antigenemia as the golden standard method for CMV detection, and consequently CMV infection definition. CMV disease is usually defined as CMV infection accompanied by clinical manifestations. The most common of these is a viral syndrome with malaise, fever, leucopenia, atypical lymphocytosis, thrombocitopenia, mild to moderate elevations of serum aminotransferases often in a self-limiting process that does not require treatment. Of greater concern is organ involvement that may be localized to a single organ or disseminated if there is involvement of 2 or more non-contiguous organ sites. Organ involvement is defined as histopathologic evidence of CMV with or without a positive viral culture of involved tissue. In the context of the present work, CMV disease was defined as presence of the above mentioned clinical signs in association with positive pp65 antigenemia. Whenever this happened, ganciclovir therapy (5 mg/Kg every 12 hours) was always initiated for 14 days, or until negative antigenemia results were observed. Thus we considered all patients who were not treated as without CMV disease. For the same reason, the moment of ganciclovir prescription was considered as the onset of CMV disease. CMV antigenemia assay was carried out on 3 ml of EDTA-anticoagulated blood within 4 hours of specimen collection. The pp65 antigen was detected with the commercial assay CMV-vueTM (DiaSorin, Stillwater, Minnesota 55082-0285, USA), with a few modifications. The antigenemia assay consists of four major steps - isolation of the polymorphonuclear leukocytes from 3 mL of EDTA-anticoagulated blood by dextran separation and ressuspension of the leukocyte in PBS to give a final cell density equivalent to 2 × 106 leukocytes/mL; preparation of two cytospin slides and fixation of the cells in formaldehyde; incubation with a mix of two mouse monoclonal antibodies (C10 and C11) directed against the pp65 followed by incubation with horseradish peroxidase-coupled rabbit anti-mouse IgG after which a peroxidase mediated chromogenic reaction takes place; quantification under a light microscope by counting the number of positively stained leukocytes and the total number of leukocytes per slide. The results were given as the total number of positive leukocytes/50.000 leukocytes. For quantification of CMV DNA, the commercial assay Cobas Amplicor CMV Monitor Test (Roche Diagnostics Systems, Inc., Branchburg, NJ, USA), directed against the CMV polymerase gene, was performed on 200 μl of plasma according to the manufacturer recommendations (see ref. 12 for details). The results were expressed as DNA copies per mL of plasma. The linear range of the assay is 400-400.000 copies of CMV DNA per mL. Amplification and detection of CMV pp67 mRNA transcripts was done on 100 μl EDTA anti-coagulated blood using the commercial assay Nuclisens pp67 Assay (Organon Teknika, Boxtel, Netherlands) according to the manufacturer's instructions (see 16 for details). Total nucleic acids were isolated by the Boom guanidinium thiocyanate-silica procedure in a semi-automated procedure  with Nuclisens Automated Isolation Reagents (Organon Teknika, Boxtel, Netherlands) and Nuclisens® Extractor (Organon Teknika). The results were expressed as presence or absence of CMV pp67 mRNA. The performance of the 3 methods used, relative to the prediction of the development of disease, was statistically analysed using the following definitions: Sensitivity was calculated as the proportion of the determinations done during disease episodes that tested positive; Specificity was defined as the proportion of the determinations done during disease-free episodes that tested negative; Positive predictive value was calculated as the proportion of "test-positive" determinations that occurred on patients that developed disease; Negative predictive value was defined as the proportion of "test-negative" determinations that occurred on patients that did not develop disease. Determinations on patients that developed disease were compared with the results observed on assymptomatic patients using the Mann-Whitney U test. All 87 sequential specimens obtained from 10 liver transplant recipients were assessed by CMV antigenemia and CMV monitor, whereas only 82 specimens were available for CMV pp67 mRNA assessment. The presence of an internal control in CMV monitor assay allowed the identification of 1/87 samples with amplification inhibitors. A similar control was also present in the Nuclisens CMV pp67 assay, revealing that none of the samples studied showed signs of reaction inhibition. The results obtained with the 3 tests were concordant in 58/82 samples (70%). Of these, 57% (33/58) were negative and 43% (25/58) were positive for CMV. Taking the antigenemia determination as the "golden standard" (the routine method used for clinical management), all patients developed CMV infection. According to the serostatus before transplantation, 1 patient had a primary CMV infection. CMV monitor test detected CMV infection in 10/10 patients, while CMV pp67 mRNA was only capable of detecting the infection in 8/10 patients. It must however be noted that the two discordant patients never developed CMV disease. The onset of CMV infection was on average 31 days (range 17-69) by antigenemia pp65, 40 days (range 23-70) by CMV monitor, and 37 days (range 17-69) by pp67 mRNA assay. Contrary to our expectations, CMV positivity was never detected earlier by molecular biology assays than by antigenemia. In fact, the 4 patients with discordant ascending kinetics (patients A, B, D and E - Fig 1) presented a positive antigenemia result one determination earlier than the two other assays. It must however be noticed that: 1) two of the 4 patients had no CMV pp67 determination at the discordant points; 2) antigenemia determination was in all cases only 1 positive cell/50,000 cells, and; 3) none of the 4 patients ever developed CMV disease. Kinetics of CMV determination by antigenemia (squares), CMV monitor (small dots), and CMV pp67 mRNA (circles), in the 5 patients that did not develop CMV disease. The right Y-axis was used for qualitative pp67 mRNA assay: P = positive; N = negative. CMV pp67 mRNA assay was found to show positivity latter than CMV monitor, since 3 patients (A, D and E - Fig 1) had positive antigenemia, positive CMV monitor and negative pp67 mRNA. Again it must be noted that none of these patients ever developed CMV disease and CMV pp67 mRNA assay was always negative for patients D and E (fig 1). Considering CMV clearance as one negative result by at least one CMV viremia assay, after being positive by the same assay, 8 patients (all but patients D and F - fig 1 and 2) showed analytical signs of CMV clearance. In these patients, antigenemia was found to be the first test to become negative in 3/8 patients (H, I, J-fig 2). Furthermore, this method was found to become negative concomitantly to Nuclisens CMV in 3/8 patients (B, C and I - Fig 1 and 2), whereas CMV monitor was the last test to show CMV clearance in 4/8 patients (B, C, H, I-fig 1 and 2). Kinetics of CMV determination by antigenemia (squares), CMV monitor (small dots), and CMV pp67 mRNA (circles), in the 5 patients that developed CMV disease. The arrows indicate the onset of CMV disease, and the red rectangles the period of ganciclovir administration. A black R on a red circle indicates a retransplantation surgery. Patient F died at the second retransplantation surgery for reasons not related to CMV disease. The right Y axis was used for qualitative pp67 mRNA assay: P = positive; N = negative. Only 5/10 patients developed clinical CMV disease, as defined in the Materials and Methods section. On average, the onset of CMV disease was 36 days post-transplant (range 30-43 days), and at this time all tests showed positive results (fig 2). Next, we compared the results of patients with and without CMV disease. As can be seen on table 1, the onset of CMV infection was detected roughly at the same time (28-29 days) in patients with CMV disease by all 3 assays. In contrast, patients that did not develop CMV disease showed antigenemia pp65 positivity on average 16 days earlier than the 2 other molecular biology assays. As a result, only molecular biology assays were found to distinguish the onset of infection between patients with and without CMV disease clearly and in a statistically significant way (table 1). Furthermore, it may be significant to observe that the only test that remained negative in 2/5 patients without CMV disease was the pp67 mRNA assay. Also, quantitative results at the onset of infection were, on average, higher in patients with CMV disease as compared to patients without CMV disease (table 2), although the difference did not reach statistical significance. a) p = significance level for the difference between patients with and without disease, according to the Mann-Whitney U test; n.s.= not significant b) Antigenemia results are given as positive cells per 50,000 cells c) CMV monitor results are given as copies/mL d) Two patients without CMV disease were always negative by CMV pp67 mRNA. Thus onset of CMV infection by this assay only includes data for 3/5 patients without CMV disease. In order to identify the most sensitive method for the identification of patients at risk of developing CMV disease, we compared results obtained on the available samples before the onset of disease (one week on average; range 4-15 days). As can be seen on table 3, the results showed that if we set an antigenemia cut of value of 8/50,000 cells, patients with disease had antigenemia results higher than the observed for patients without disease. The only exception among patients with disease was patient J, that showed negative determinations 15 days before the onset of clinical disease, and no latter determination was available before disease was observed. Also, patient C, despite not developing CMV disease showed one determination with 31 cells/50,000. Curiously, at this stage, all methods showed positive values. Similarly, CMV monitor determinations were in general above 2000 copies/mL in patients with disease, which is in accordance with the literature [10,13]. Again, this cut-off would include 2 patients that never developed disease (patients A and C; table 3), and exclude 1 patient that developed disease (patient J, that showed negative determinations by all methods used; table 3). Similarly, although pp67 mRNA determinations correctly identified 2 patients that did not develop disease, this was not the case for the remaining 3 patients. We then compared statistically the performance of the 3 methods using all determinations before onset of disease (table 4). Since the desired outcome is to be able to identify patients at risk of developing CMV related disease, the most relevant statistical determinations are the positive predictive value and the negative predictive value. Interestingly, these determinations were far better for the pp67 mRNA methods when only the determinations before beginning of treatment were considered (table 4). Furthermore, for the same determinations, and with the exception of pp65 antigenemia positive predictive value, the refinement introduced into pp65 antigenemia and CMV monitor by the inclusion of cut-off values did not significantly improve the respective negative and positive predictive values relative to raw pp67 mRNA determinations (table 4). Also the specificity of the pp67 mRNA assay was found to be better than the observed with the antigenemia and CMV monitor raw data before beginning of ganciclovir treatment. Finally, when taking in consideration all determinations, the 3 methods seemed to behave similarly (table 4), again, with slightly better raw data performance observed for the pp67 mRNA assay. All 10 liver transplant recipients developed CMV infection after transplantation. The onset of infection occurred between the 3rd and the 4th week post-transplant, which is in accordance with the literature . Detection of infection was found to be of little clinical significance, since only 5/10 patients developed CMV disease. It must however be stressed that the present sample was specifically chosen to include a similar number of patients with and without disease (see materials and methods section), and does not reflect the overall CMV disease incidence in the Liver Transplant Unit. In fact, the readily available data on 136 of the total 190 patients showed that despite 105 patients (77,2%) showing positive antigenemia results, only 13 patients (10.46%) developed CMV disease (3 of these were CMV seronegative at transplantation). Antigenemia and CMV monitor were equally sensitive in the detection of CMV infection. However, the results obtained by pp67 mRNA assay were clinically more significant, as 2 patients that never showed infection by this method, did not develop disease. The onset of infection was detected earlier by antigenemia than by the molecular biology assays. However, this difference was only seen in patients that did not develop CMV disease. This curious observation may reflect the different protein/mRNA targeted, as well as the different clinical material used by each assay. Antigenemia targets the detection of an immediate early antigen within infected cells. It is thus capable of detecting CMV at a very early stage of infection. The pp67 mRNA detected by the NASBA assay is a delayed early gene that should be detected at a slightly latter phase of infection. Finally, the CMV monitor assay is targeting the detection of the polymerase gene on plasma, and should therefore be positive only if viral particles are circulating in the blood stream. Therefore, this method should be expected to be the last to detect CMV infection. Adding to these differences, also the effect of immune system mediated viral clearance can be expected to differentially influence the results on the 3 different assays used. The early antigens/mRNA species could be detected even in the cases where the immune surveillance will suffice to prevent CMV disease, whereas detection of circulating viral particles could be expected to be clinically more significant in this regard. Thus, the observation that antigenemia CMV detection is only detected earlier among patients that do not develop disease may also be the result of a faster evolving infection kinetics among the patients whose immune system is unable to control the infection. Not surprisingly, viral load at the onset of infection was found to be higher among patients that developed disease than among patients that remained assymptomatic. Furthermore it was curious to observe that the onset of infection was earlier in patients that developed disease than in the patients without disease, suggesting that the earlier the infection, the higher the clinical risk. In fact, both molecular biology methods never detected the onset of infection before day 32 in patients without disease, whereas in patients with disease the detection of the onset of infection was until day 35. These two observations are in agreement with previous reports by others [19,20,21,22] and support the possible use of kinetic trends as well as viral load data in the identification of patients at risk of developing CMV related disease. This could be an important contribution, since it was difficult to relate viremia results alone to the clinical disease status. Neither pp67 mRNA assay, nor CMV monitor or antigenemia pp65 determinations produced results readily distinguishable between patients with and without disease. The only possible discrimination by viral load was obtained by defining a cut-off value for antigenemia of 8 positive cells per 50.000, which is in agreement with the 4-6 cells/slide described in a previous independent study . When the data is treated this way, patients with disease were generally distinguishable from patients without disease. Similarly, the best discriminative value for the CMV monitor assay (2000 copies/ml) is in agreement with the 2000-5000 copies/ml previously described by others . CMV pp67 mRNA assay was the only method whose raw data showed negative values in some (but not all) of the patients without clinical disease, presenting one false negative (a false negative identified as such by all 3 methods), and 3 false positives. 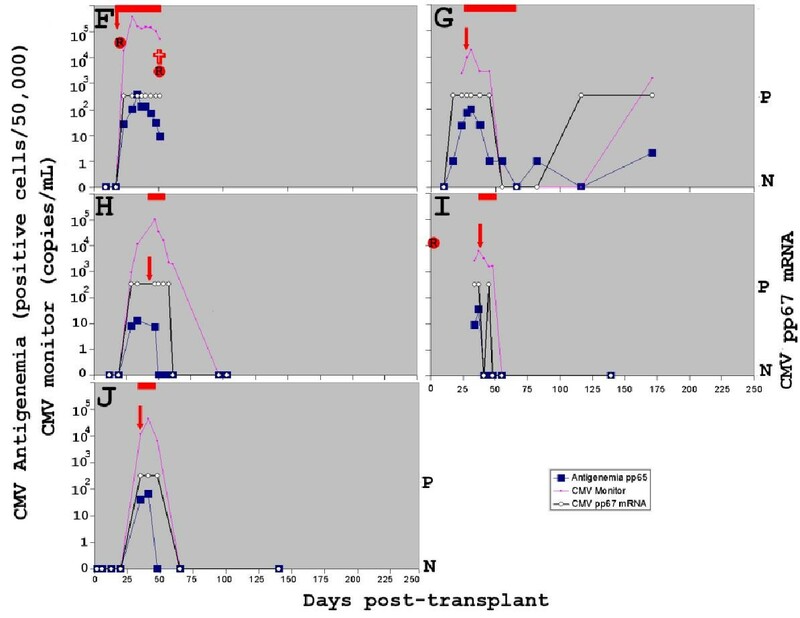 However, it must be reinforced that the false positive values observed both for CMV monitor and CMV pp67 mRNA assay could be correctly interpreted if viremia kinetics were taken into consideration, since in all these cases positive values occurred after the 30th day post-transplant (see fig 1). Finally, when all data observed until beginning of ganciclovir therapy was considered, pp67 mRNA assay was also the method that showed the best positive and negative predictive values. Furthermore, contrary to CMV monitor determinations, pp67 mRNA results were also found to be of use for the follow-up of the response to antiviral therapy, further increasing its potential usefulness for the assessment of patients after liver transplantation. Molecular biology methods alone did not seem to discriminate patients at risk of developing CMV disease better than antigenemia. Thus, although the small number of patients studied does not allow us to reach definite conclusions, if only one test is to be used, antigenemia seems to be the best choice. It appears however that molecular biology methods have a better performance in discriminating the kinetics of the onset of infection, which seemed to correlate well to the risk of developing CMV disease. Furthermore, despite its qualitative nature, CMV pp67 mRNA assay was, in hour hands, without the need to use arbitrarily defined cut-off values, the method with the best negative and positive predictive values for the development of CMV disease. Thus, our results support the need for larger studies testing the possible advantage of concomitantly use antigenemia and pp67 mRNA assays to the prediction of CMV disease in liver transplant recipients. The authors wish to acknowledge the Portuguese branches of Organon Teknika and Roche for the kind support of this work in the form of free kits donations.